Ezra is an ageless child of the Black Sun, seeking to rid the world of the evil that has plagued her since childhood. The 10th Muse is Emma Sonnet, a warrior styled in the tradition of the mythological muses of Zeus. 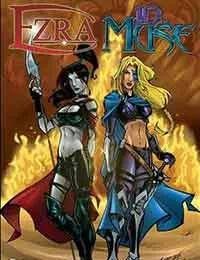 These two characters come crashing together in a crossover book that provides an ample display of action, gore, and female bodies defying gravity. In seeking to eliminate Medusa, the longtime foe of the 10th Muse, Ezra risks undoing history. When the 10th Muse steps in to stop her, all hell breaks loose. It is only upon recognizing the need for cooperation that these two heroines can join.